Hedge pruning shears are designed for cutting or pruning hedges or shrubs (small bushes) in order to cut back excessive new growth. This will not only give your hedge or shrub a tidy appearance, but it also helps to promote new growth and improve the overall health of the plant in question. 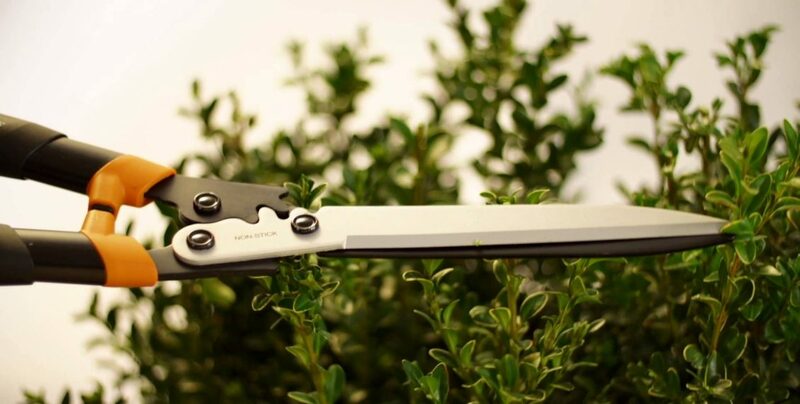 Out of all of the pruning tools in a gardeners arsenal, hedge pruning shares have the longest blades, allowing you to cut more growth back in a single cut. That makes them ideal for tackling larger jobs in a shorter period of time i.e. a hedge row. It also allows you to shape a plant more quickly than if you were to use standard hand pruning shears. Usually the average gardener will keep a high quality pair of regular hedge pruning shears handy in the garden tool shed. They’re very useful for the odd job here and there. However, if you have a large amount of hedge pruning to do on a regular basis, you might also want to consider investing in an electric hedge trimmer to save time. These come in both corded (requires an extension cord and power outlet) or battery operated varieties. Keep in mind that whilst it might be tempting, hedge pruning shears are not designed for intricate tree pruning or to prune medium to large sized tree branches. If you do try to cut tree branches, you’re more than likely to end up hacking at them multiple times. That will leave the cut stem much more prone to catching diseases. The ARS HS-KR1000 Professional Hedge Shears come in as the highest rated hedge pruning shears on Amazon with a 93% 5 out of 5 satisfaction rating. 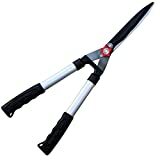 These are professional high quality garden hedge shears that will last a lifetime with proper care, however the price does reflect that (almost 2-3 times the price of other hedge pruning shears). 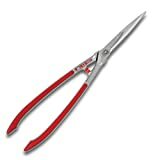 #2 TABOR TOOLS B640A Hedge Shears for Trimming Borders, Boxwood, and Bushes. 24” Manual Hedge Clippers with Professional Wavy Blade and Comfort Grip Aluminum Handles. TABOR TOOLS B640A Hedge Shears for Trimming Borders, Boxwood, and Bushes. 24” Manual Hedge Clippers with Professional Wavy Blade and Comfort Grip Aluminum Handles. The TABOR TOOLS 24″ Manual Hedge Clippers are a good quality hedge clipper for a low price. If you don’t have a lot of hedge pruning to do on a regular basis, these could be a good option for you. The blades are made from carbon steel with a non stick coating to improve cutting performance and making cleaning them easier. They also have a wavy design to cut all of the way to the tip and produce crisper cuts. The Fiskars 23 Inch PowerGear Hedge Shears are fantastic low cost garden shears that will tackle most pruning jobs the average gardener will have with relative ease. The have been built with a patented “PowerGear” gearing mechanism that amplifies the cutting force near the middle of the cut, where resistance tends to be greatest. This makes cutting 3 times easier than standard “single pivot” hedge shears, reducing the effort and workload required to cut your hedges.